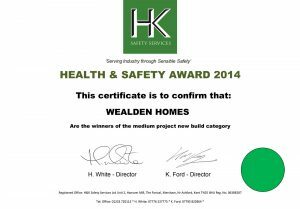 We are delighted to receive two awards from our Health and Safety auditors based on their monthly inspections to our sites. Congratulation to Simon, Site Manager for the Grigg Lane development, which was the winner in the medium new build category. Congratulations to Nick, Site Manager for the Atkins Close development, which received an excellence commendation in the large project new build category.